Former Pittsburgh Post-Gazette editorial cartoonist Rob Rogers will headline a National Press Club Journalism Institute event at 6 p.m. Thursday, July 19. 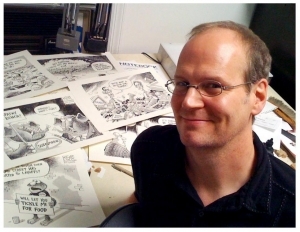 Rob Rogers, a former editorial cartoonist for the Pittsburgh Post-Gazette whose edgy work was too hot for his publisher to handle, will talk with Pulitzer Prize-winning cartoonist Ann Telnaes of the Washington Post at a National Press Club Journalism Institute (NPCJI) event at 6 p.m. on Thursday, July 19, in the Club's Bloomberg Room. You must have a ticket to attend the two-hour event. Click here to reserve your space. The conversation will be followed by a question-and-answersession. Both Rogers and Telnaes will sign copies of their books, which will be available for purchase. NPCJI is the non-profit affiliate of the National Press Club.